Apple crisps are tricky. They almost always look and smell great, but only sometimes taste good too. It’s hard to find the right balance between tart and sweet; more times than not I think an apple crisp is too sweet. This recipe, however, is a perfect match of the sourness of Granny Smith apples and the sweetness of the sugar. Mix sugar, 1 tablespoon flour, cinnamon, and nutmeg in a large bowl. Pour in apples and stir to coat evenly. Pour into a 9×13 inch pan and pour water on top. Combine the oats, 2 cups flour, brown sugar, baking powder, baking soda together. Cut in butter until crumbly and sprinkle over the apple mixture. Bake at 350°F for about 45 minutes. 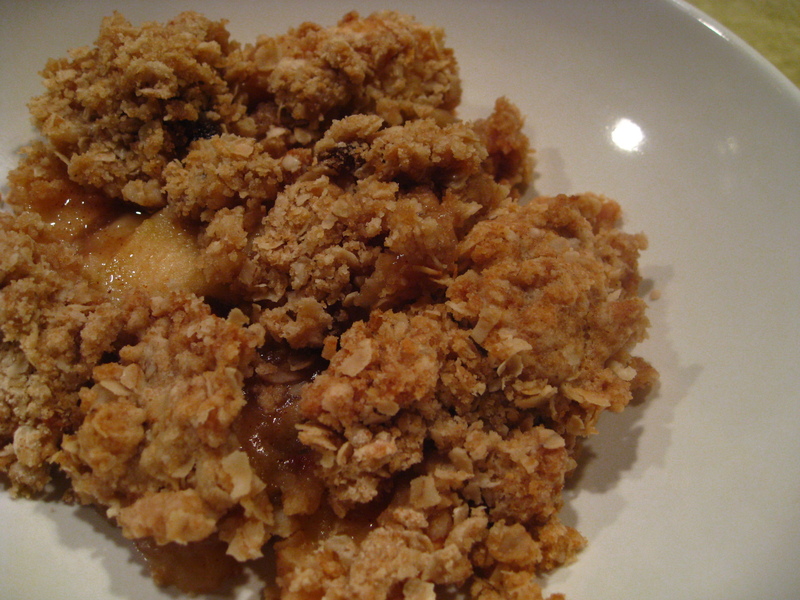 Categories: Cobblers, Crisps & Crumbles, Dessert | Tags: dessert, fruit, pie, vegetables | Permalink.